It was 4AM in the grasslands of southeast Montana. I was spending the night under the stars while my camera clicked away, but the cold breeze made sleep hard to come by. I thought I detected a bright flash of light, but wasn't sure if my eyes were playing tricks on me. It wasn't until I got home that I found the source: a fireball meteor. According to American Meteor Society reports, the meteorite likely fell near the CO/WY border some 300 miles away. It theoretically should have been visible from 10 states, I can only imagine how bright it must have been overhead. The green color reveals the composition to be mostly nickel, and it left behind a vapor trail (known as a persistent train) for over 10 minutes afterwards. My only goal was to capture the milky way for the first time this year after it hid behind the sun for the winter. The fireball was just a bonus. Last edited by bystander on Mon Mar 26, 2018 10:48 pm, edited 1 time in total. This image of M82 was photographed by Lars Zetterlund using a C14 during 2 nights for a total of more than 12 hours. I helped with the post processing of the images mixing the Ha to the LRGB files. 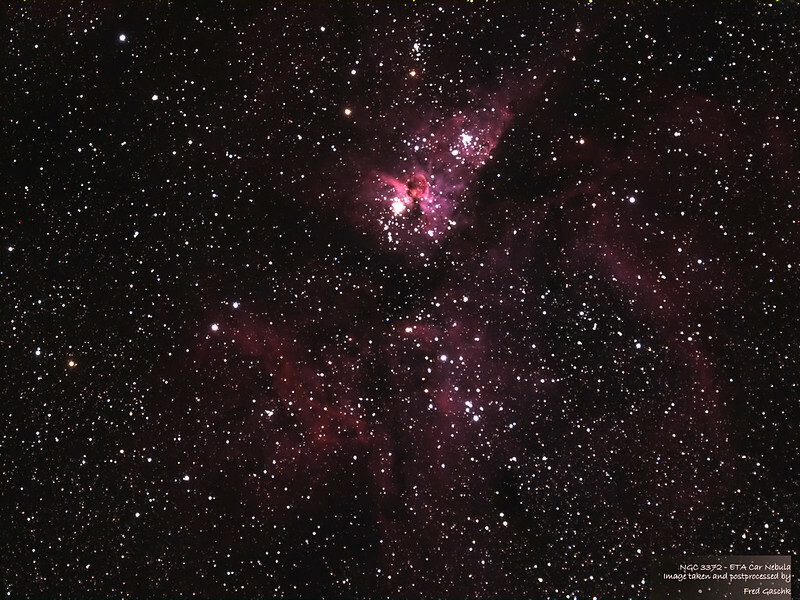 This HDR image is constructed from 12 sets of exposures ranging from 1/8 sec ( to capture the bright centre of Eta Carinae ) through to 240 seconds. Total exposure time around 13 hours. Captured from a home observatory with an unmodified Nikon D5300 DSLR mounted on a 12" Newtonian telescope ( Orion Optics CT12 ). Here is my latest image taken at "Stellar Winds Observatory" a/k/a Stan Watson Observatory at Dark Sky New Mexico. I believe this is one of the first color amateur images of this galaxy group. Last edited by markh@tds.net on Tue Mar 27, 2018 6:19 pm, edited 1 time in total. 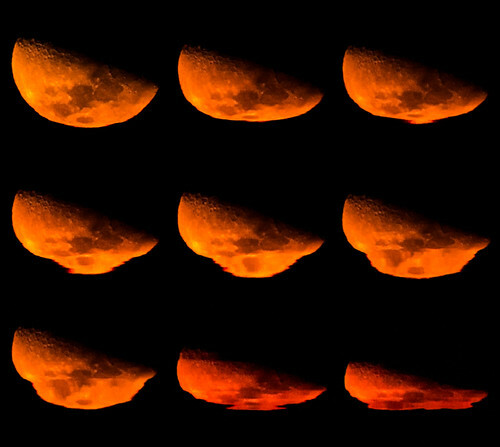 9-panel mosaic created with Rokinon 135mm + QSI583. Each panel is 12x300 LRGB for a total of 36 hours taken from December 2017 through early Feb 2018. 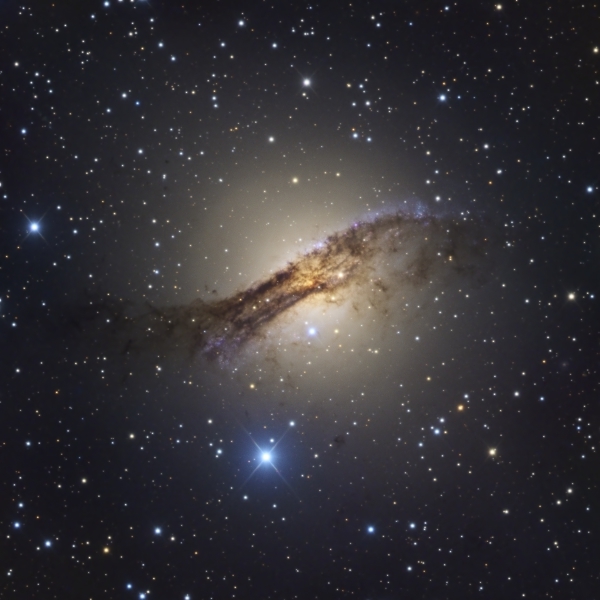 Image taken at Deep Sky West. Very beautiful! Great details and delightful colors! Here is my latest image taken at "Stellar Winds Observatory" a/k/a Stan Watson Observatory at Dark Sky New Mexico. I believe this is on of the first color amateur images of this galaxy group. Wow, this is very, very beautiful and detailed indeed! It is downright fascinating to study the individual galaxies here! Thanks for the splendid image! Under some unseasonably favorable conditions, this view of the Needle Galaxy offers some great detail that typically eludes a fairly modest AP setup. I encourage you to click into the full scale image link below, pan around, and check it out! Thanks for looking. 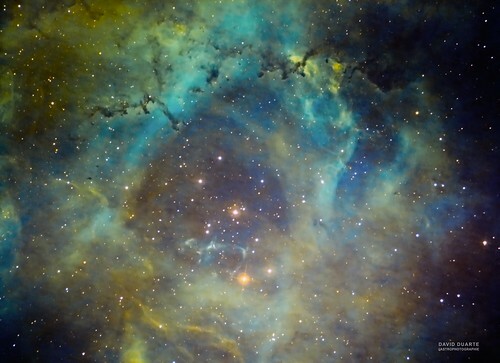 Hey there, hope it`s okay that Ill place my image of NGC3372 - eta carina nebula. It`s my best astro image I`ve done till now. And yes, I know there is so much more to learn about, and to work on till I am able to produce an APOD worthy image, but I now that this way will be worthy for me too. 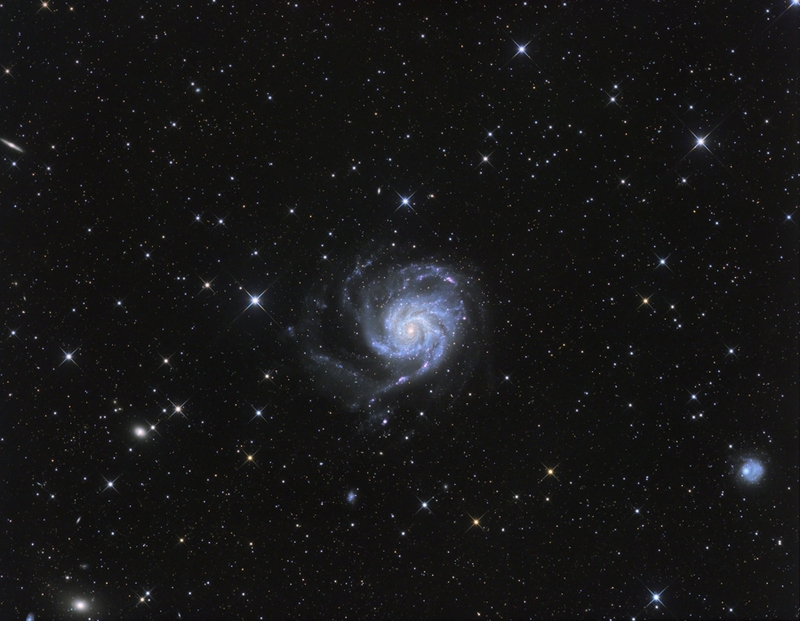 It`s made with the T13 SSO - Telescope, with a total exposure time of 5x 600 sec - single shots. Aligned with Nebulosity 4, and postprocessed with PS.CC18. I processed this image with publicly available data from the Las Cumbres Observatory. The PI for this observation was Edward Gomez at the Las Cumbres Observatory. 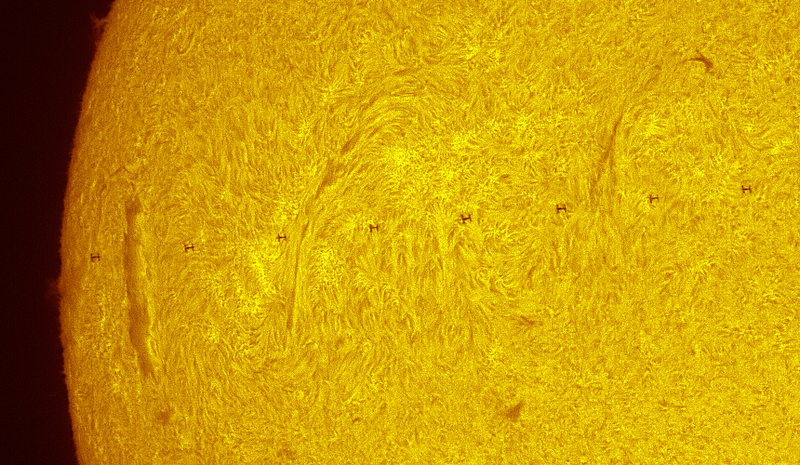 This image included data collected with B, V and R filters. The data comes from 1 m telescopes at the South African Astronomical Observatory and Siding Spring Observatory in Australia. Larger version is here. I would like to watch the reentry: what nice fireworks it will be! 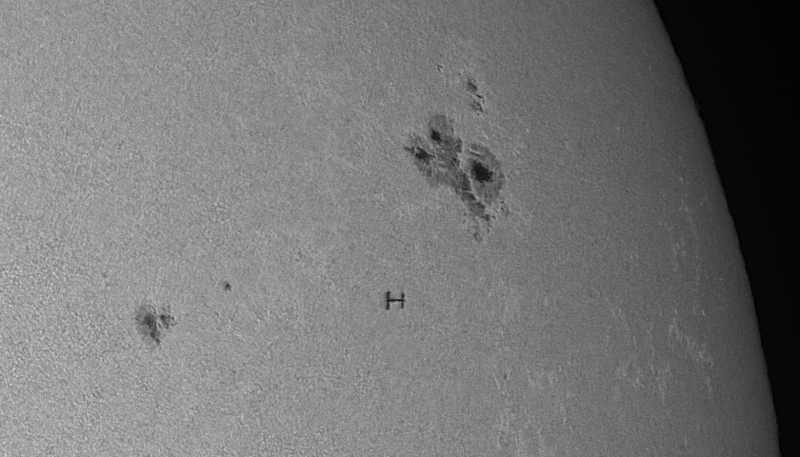 Two solar transits of Tiangong (docked to the Shenzhou module) taken in June 2013 from Southern France, in H-alpha with prominences and in white light amongst nice sunspots. At a speed of nearly 8 km per second, those transits lasted only 1/2 second: one must be at the right place at the right moment! Last edited by bystander on Fri Mar 30, 2018 1:26 pm, edited 1 time in total. 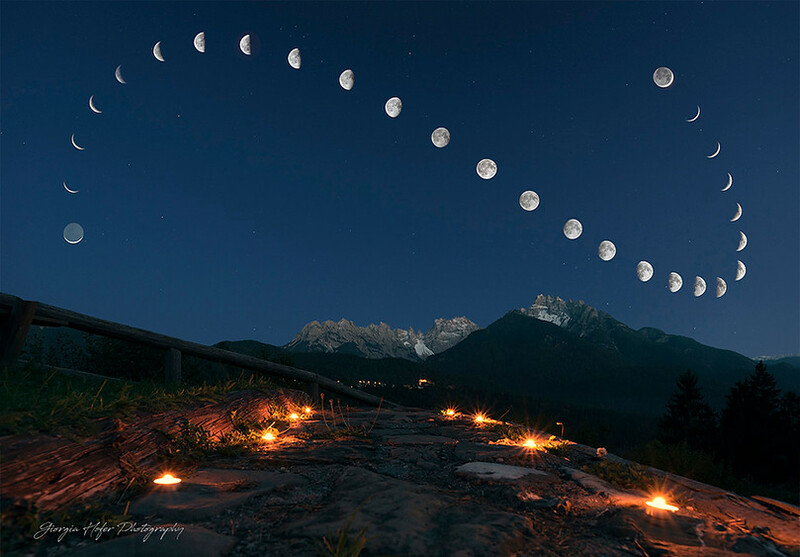 In this composite image I wanted to represent the position and the changing phases of the Moon above the peaks of the Cridola Group, in Italy, during a lunar month, called synodic month. Exp. 8 sec, iso 800, f/8. Last edited by bystander on Fri Mar 30, 2018 1:49 pm, edited 1 time in total. First SHO (Sulfur / Hydrogen / Oxygen) imaging test on the Rosette nebula (NGC 2237). This method called "Hubble Palette" makes it possible to bring out in false colors the chemical components of certain nebulae and to highlight them. The nebula is about 5000 A.L of us! Hi all, this is my first post on this forum. I’ve decided to share my last image taken yesterday in remote from Siding Springs using the T8 telescope’s of iTelescope, a wonderful takahashi 106/530 with FLI CCD Microline 16803. The image capture the conjunction between Mars and Saturn with M22, M28 and a lot of other objects. 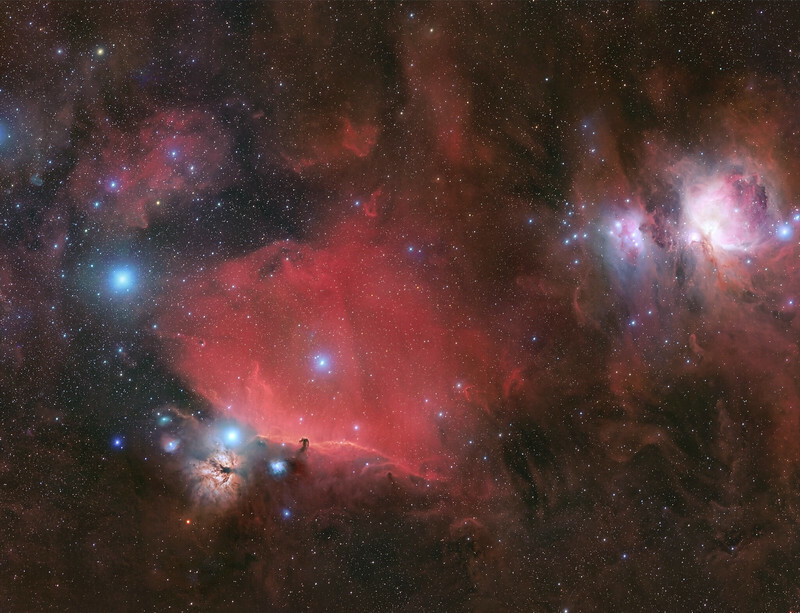 The region is in Sagittarius constellation, prospectively in the center of our Milky Way, and it’s possibile to se in image the classic color of this region and the dark powder. Processing with Pixinsight and Photoshop. Last edited by bystander on Sat Mar 31, 2018 12:39 am, edited 1 time in total. Last edited by bystander on Sat Mar 31, 2018 4:00 am, edited 1 time in total. 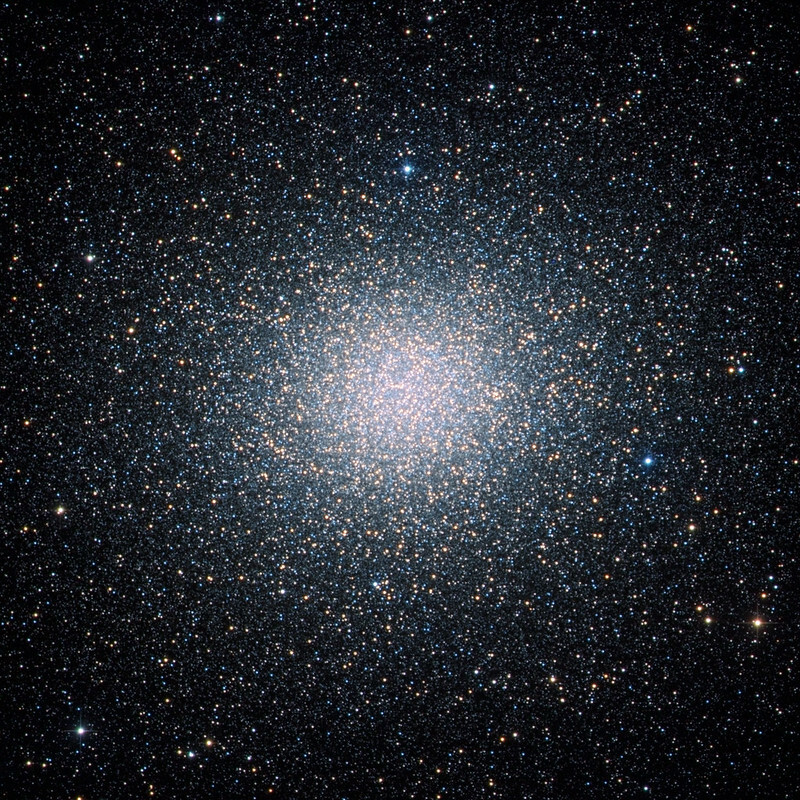 Omega Centauri (NGC 5139, Caldwell 80) is the biggest and brightest globular cluster in the night sky. The cluster appears to us Earth-dwellers as slightly larger than the full Moon. 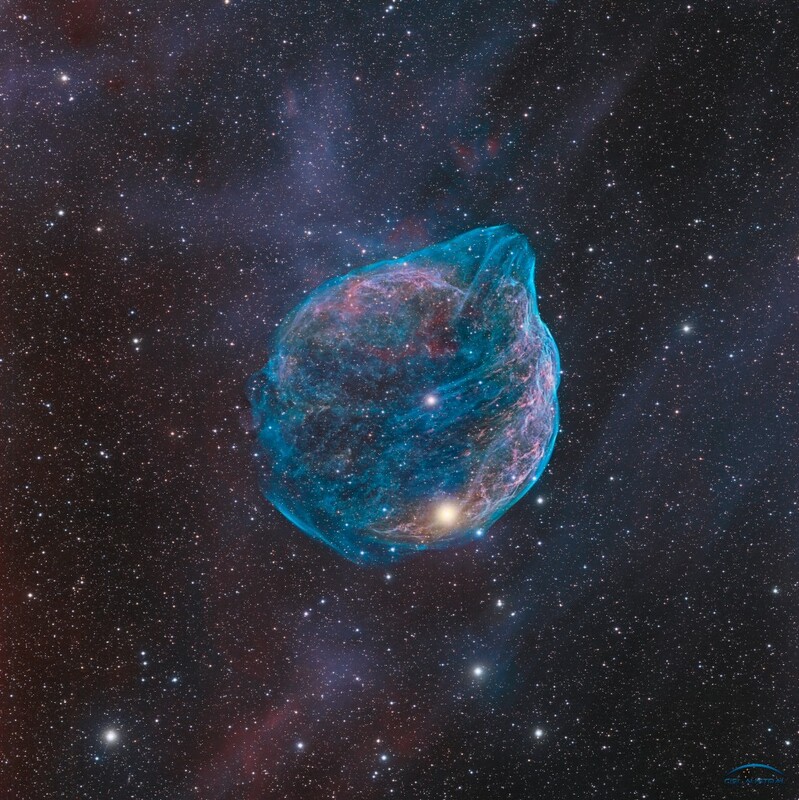 It is actually about 150 light years in diameter and contains around 10 million stars. To image this magnificent object I logged on remotely to iTelescope T32 at the Siding Spring Observatory in New South Wales, Australia. 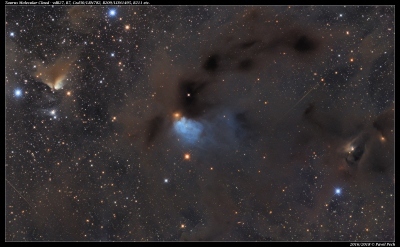 Total imaging time, through LRGB filters, was 30 minutes. 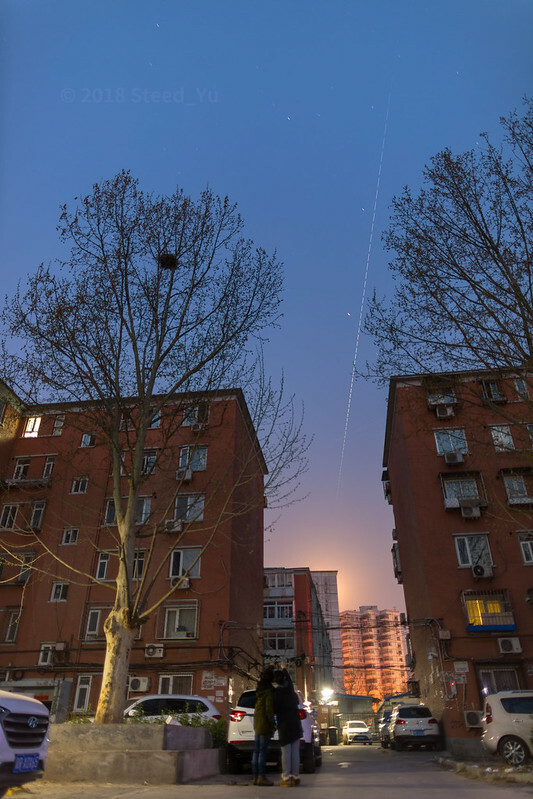 At 5:25 in the morning on April 1st, Tiangong-1 was just passing through the Beijing city and left a trail in the morning light. Tiangong-1 today was not only brighter then ever, but also moving more quickly than normal. This is because the space station is less than 180 kilometers above the ground, and it will re-entry the atmosphere tomorrow as predicted. Perhaps this is a farewell to Tiangong-1.